"I fell on the floor. After I fell on the floor, I heard nine more shots," said one woman who witnessed the shooting. Police say a shooter opened fire in the area of Silver Hill Road and Suitland Parkway on Tuesday morning. Suitland Parkway eastbound and westound lanes were closed for several hours and reopened about 5 p.m.
A 23-year-old man was shot and killed Tuesday morning after someone opened fire in the area of Suitland Parkway and Silver Hill Road in Prince George's County, Maryland, police said. The suspect is still on the loose. Police responded about 9:30 a.m. and found Jerome Robinson, of Southeast D.C., in the roadway of Suitland Parkway. Police are searching for a white Audi sedan in the shooting but advised caution because the occupants may be armed with an assault rifle. According to a preliminary investigation, the incident may have begun off the parkway as an altercation between occupants of two separate vehicles, U.S. Park Police Sgt. James Dingeldein said. 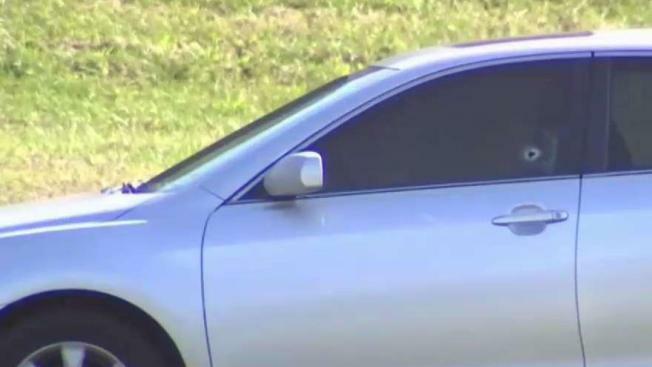 Police are searching for a car similar to the white Audi pictured above that was involved in a shooting on Suitland Parkway that left a 23-year-old dead. The vehicles involved got on the Parkway, where witnesses reported hitting the ground as about 20 gunshots rang out. "I seen some guy shooting," one woman told News4. "They were in the car. He was sitting in the passenger's window and he was just shooting a machine gun." Sources close to the investigation told News4 the gun involved may be an AK-47. 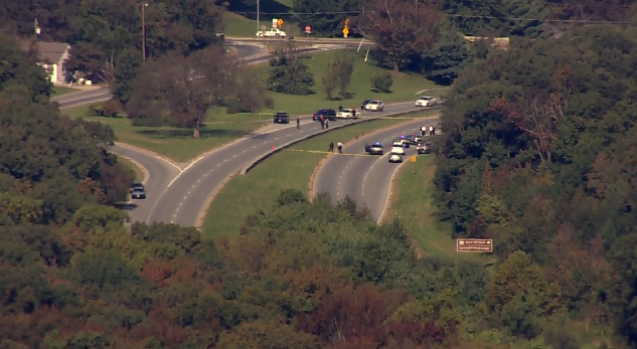 At one point, the victim got out of his vehicle and ran across Suitland Parkway, where he was hit by gunfire from the people in the other vehicle, police said. Several bystanders moved to help the shooting victim, who witnesses said was armed. Then, the shooter doubled back and let loose more shots. Prince George's County Fire and EMS said the victim was taken to an area trauma center in critical condition. He died a short time later. Evidence of the violent encounter could be seen in the windows of two cars at the scene. One car was left with a bullet hole in the lower right corner of the driver's side window. Another had what appeared to be bullet holes in the windshield. A trail of bullet casings showed littered Suitland Parkway afterward. "We see the shell casings go up the whole road there, on the ramp, the whole road going back," one witness said. One woman who was walking in the area at the time said the gunfire sent her running for cover. "I was walking toward Suitland Parkway, and I heard nine shots. I went back and ran to my house, got to my door, six more shots. I fell on the floor. After I fell on the floor, I heard nine more shots," the woman said. Officers remained at the scene Tuesday afternoon for the investigation. They said they don't believe the public is in danger at this time and the incident appeared to be isolated. The suspect is still on the loose. Prince George's County Fire and EMS said one victim was taken to an area trauma center in critical condition. Detectives don't have suspects and urged anyone who may have witnessed the incident to call the U.S. Park Police tip line at 202-610-8737 or submit a tip online here. The eastbound lanes of Suitland Parkway were closed from Naylor Road to Forrestville Road and the westbound lanes were closed from Forrestville Road to Silver Hill Road for several hours, Park Police said. They reopened about 5 p.m.
Chopper footage showed yellow tape stretched across the roadway. Drivers in the area should expect delays and should consider using Pennsylvania Avenue or Branch Avenue as a workaround. Multiple drivers called 911 to report the shooting. Witnesses started calling 911 about gunfire being exchanged at Silver Hill Road at Pennsylvania Avenue. The calls continued until it ended at Suitland Parkway at Silver Hill Road. CORRECTION (Oct. 23, 3:23 p.m.): An earlier version of this story said police confirmed one victim, but that a second person had also been reported injured. However, only one person was injured. Stay with NBC4 and NBCWashington.com for more on this developing story.